VertaseFLI was engaged to treat historic coke works waste at the Former Lambton Coke Works and Colliery site which was to be redeveloped for a mixed end use of residential housing, along with public open space areas. The waste types included spent oxides, tar and hydrocarbon impacted soils. VertaseFLI devised a multi-tiered treatment train to address the different waste streams - intensive soil processing; ex-situ bioremediation; stabilisation / solidification; and offsite disposal. Waste materials selected for bioremediation comprised light and heavy oil / tar impacted soils. VertaseFLI designed a comprehensive pre-treatment process involving selective excavation and screening to remove oversized and deleterious material. 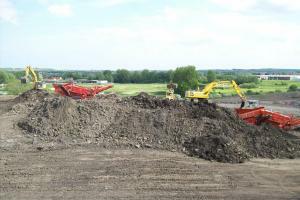 The processed soils were then set out in treatment windrows and intensively mixed and monitored to ensure active biodegradation was occurring, especially with respect to the significant proportion of potentially recalcitrant PAH impacted soils. Over the course of the project, over 65,000m3 of hydrocarbon impacted soils were bioremediated to levels below the site specific target levels. Following treatment the material was fit for reuse on site. The client had quarantined significant volumes of coal tar and tar impacted soils on site for disposal. VertaseFLI was able to reduce the overall volume of material in this stream by selectively excavating the hazardous waste from the stockpile and bioremediating the remaining soils. This process significantly reduced the client’s offsite disposal costs and enabled a greater volume of waste materials to be remediated for reuse on site. 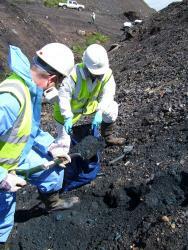 In total less than 2,000m3 of predominantly free phase tar material was removed from site. To further reduce the need for costly offsite disposal, VertaseFLI designed a laboratory trial to stabilise the inorganic spent oxides, also known as Blue Billy, which is unsuitable for bioremediation treatment. This resulted in two mix designs being assessed on a site scale. The stabilisation process effectively immobilised the cyanide by chemically and physically binding the waste within a cementitious matrix. The resulting stabilised material was fit for reuse on site. In the first phase of the project, approximately 5,000m3 of spent oxide waste was stabilised and re-used onsite. Works were complete on time, on budget and received all appropriate regulatory approvals.